Ever increasingly “fair” Venezuela displays again the totalitarian nature of Leftism and gives us a window onto what our hope and change leftists would do here if given the chance. CARACAS, Venezuela — Venezuela’s President Nicolás Maduro intensified his perceived fight Monday against “bourgeois parasites” he accuses of an economic war against the socialist country by threatening to force more stores to sell their merchandise at cut-rate prices. National guardsmen, some of whom had assault rifles, were positioned around outlets of an electronics chain that Maduro has ordered to lower prices or face prosecution. 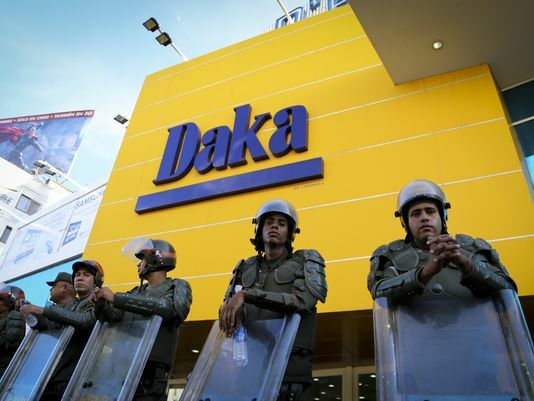 Thousands of people lined up at the Daka stores hoping for a bargain after the government forced the companies to charge “fair” prices. Maduro said his seizures are the “tip of the iceberg” and that other stores would be next if they did not comply with his orders. Maduro is expected to win decree powers in Congress in the coming days that he says will be used to take over more businesses. This entry was posted in Leftism, Progressivism, Socialism, Venezuela. Bookmark the permalink.